So yea, it's me again rising back from the dead a blogging hiatus, making my day job an excuse to cover up my plain laziness yet still has the vigor and the guts to show up at social events. Anyhoo, this installation of social scene round-up (which I now call BTW, this happened), features industry shakers visiting our rather dull habitat and the rise of a slew of game-changers, which only manifests that social life in Doha is having an 180-degree turn. Marsa Malaz Kempinski has unveiled a new face of partying in the form of Illusion, a breathtaking three-themed luxury nightspot concept that is set to offer guests an unparalleled supper club experience. 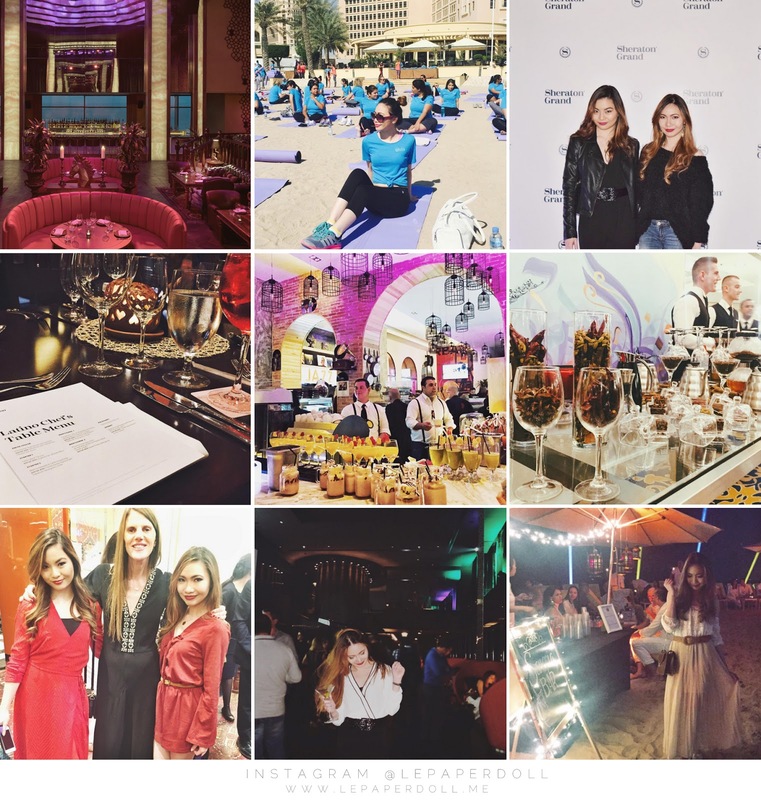 Grazia Arabia in partnership with Adidas made history as they hosted the biggest yoga event in Qatar on Intercontinental Hotel beach on a bright Saturday morning right before Valentine’s. The women’s only event, which was attended by 400 azure-Adidas-shirt-clad yogis and enthusiasts, was headed by yoga expert and Grazia Arabia’s fitness correspondent, Charlie de Rivaz (who I honestly think looks like a hotter version of Reese Witherspoon). Qatar’s Sheraton Hotel steps up its A-game after getting recognized as Sheraton Grand Doha, joining other 21 Sheraton Grand properties in the world. My lucky self got to be one of the firsts to try Latino Steakhouse's tailored five-course meal serving Latin seafood and Argentinean steaks all perfected with complemented cocktails. Yet another addition to Qatar's expanding list of upscale eateries has opened in The Pearl. Urban Jazz Kitchen, which emphasizes "a newly engineered concept which fuses the intricacies of soulful jazz music with the excitement of new flavours", aims to appeal to both foodies and music lovers. The new kitchen features an outdoor seating along the marina, a live jazz band and "a casual, laid back dining experience with an eclectic menu of distinctive selection of appetizers, flavorful salads, savory dinner entrees and delectable desserts." Just five days later their grand opening, Urban Jazz Kitchen hosted a more intimate dining experience for Doha-based bloggers in partnership with Harley Owners Group Qatar Chapter and Qatar Cancer Society. Wyndham Grand Doha introduced a new afternoon happy hour concept they developed wherein guests can "meet, recharge, or simply take a breather over cold-brewed coffee-based drinks." Try their uniquely delightful cold brews from 4:00 to 6:00 PM, Sunday through Thursday. Style maven and Vogue Japan's editor-at-large Anna Dello Russo dropped by and made an appearance at the Tory Burch event at Lagoona Mall where we, thirsty fashion enthusiasts, mingled and hung out with the ADR like it's no big deal. New York-based restaurateur Chef Richard Sandoval added yet another remarkable gastronomic spot to his ever-growing list; Z Lounge by Zengo recently launched with a banging VIP party to officially open its doors to the public last December, joining Doha's array of posh nightspots. Located on the 61st floor of Kempinski Residences & Suites, Z Lounge by Zengo is the very first nightspot in Doha that offers breathtaking 180° view of the city's skyline. Saint-Tropez Doha closed their party season last month with a unique, one-off live performance by Gipsy Kings (also called Kings of Gipsy) transforming the whole gold-and-white-covered Hilton beach into a Latino dance party. Saint-Tropez is the city’s premier members-only club. Immerse yourself in luxury with their signature beach parties, art exhibitions and high-class dining. Why don;t you try your luck and join the club by filling up the form here.